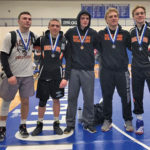 The Rockford Varsity wrestling team competed in the West Ottawa Invitational on Saturday and finished with a 4-1 record on the day and a runner-up trophy. The team opened the day against Wayland Union with a 72-12 victory, and they followed that up with a 64-11 thumping of Zeeland West. The Rockets of Muskegon Reeths-Puffer then fell victim to the Rams, 42-27. 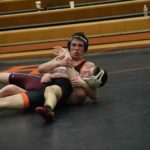 In the semi-final round, Rockford beat conference foe Caledonia 42-23 in a dual that was a preview of the week to come. The championship round pitted the Rams against Stevenville Lakeshore, who went on to win that dual 45-19. 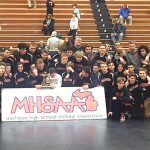 Rockford’s middleweights built the foundation of the team’s success on Saturday. Coach Brian Richardson added, “The heart of our lineup right now has been the 125-160 pounders. They have been carrying the team often and certainly the most consistent wrestlers for us right now. I’m also pleased with the way that Isaac Fetterman filled in for us today at 140 and 145.” Jack Richardson was the lone Ram to go 5-0 in the tournament. Several wrestlers compiled 4-1 records for the day. They were Trenton Yachter (125), Evan Kaser (130), Isaac Fetterman (140/145), Connor White (140/145), and Cole Gleason (152/160. The Rockford “B” team was also in action on Saturday at the Fruitport Legends Tournament. This was an individual varsity tournament featuring ten teams. The Rams finished 5th in an impressive effort. Leading the way for Rockford were Jack Tadych (130) and Moses Bosscher (135) who were second place finishers at their weights. The three wrestlers garnering third place were Mason Jakiemiec (130), Josh Hill (140), and Reed Nicholson (152). The coming week will be demanding on the young Rams. On Wednesday, they will host Caledonia in a conference dual. Then on Saturday, they will compete in the six team Stevensville Lakeshore Invitational. The Rams hope to exact revenge on the Lancers from last week’s loss.